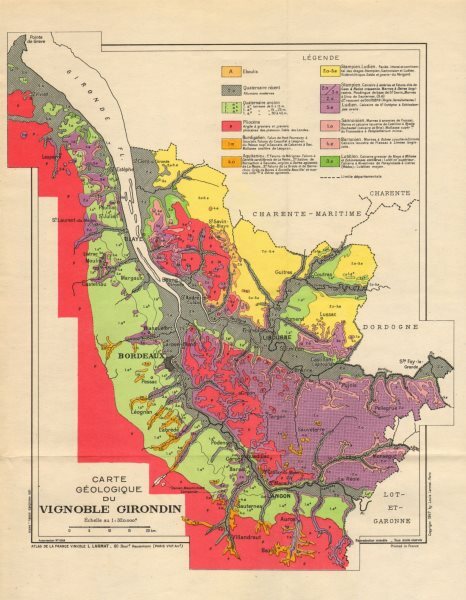 This normally pristine Bordeaux Wine Regions Map produced for DUCLOT LA VINICOLE is of course a metaphor translating the concept of "Bordeaux is 2 Banks only"... a scary metaphor in my opinion... moreover being the vision of the majority of people in the world. "All Bordeaux have the same taste and even experts have difficulty in defining the right bank and the left bank as all Bordeaux wines taste alike." 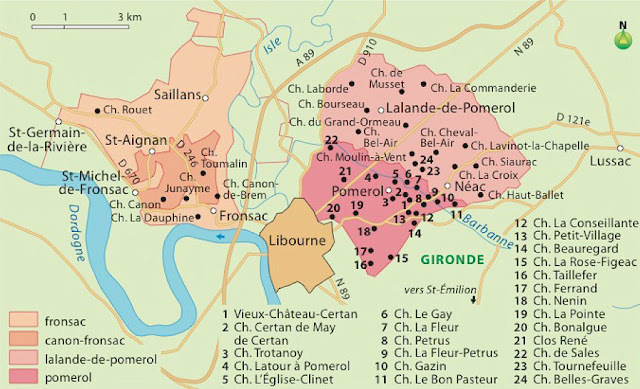 including 3,775 declared or registered as private cellars "Châteaux"
Bordeaux Appellations Map courtesy of "Vins de Bordeaux"
Each appellation with its own particular "Terroir"
"Carte Géologique du Vignoble Girondin"
from Germain Lafforgue book "Le Vignoble Girondin"
NB: this map is a very valuable proof of the diversity of the soils and subsoils of the vineyard of Bordeaux. I acquired the book and will soon this picture of the map by a better one, easier to read. 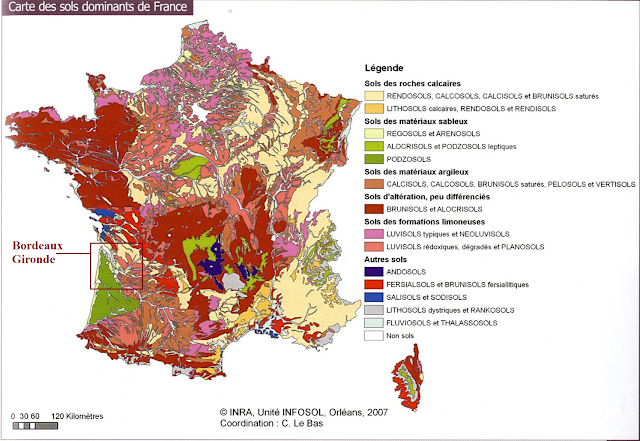 The diversity of Bordeaux soils and subsoils accounts greatly in the resulting wines too. 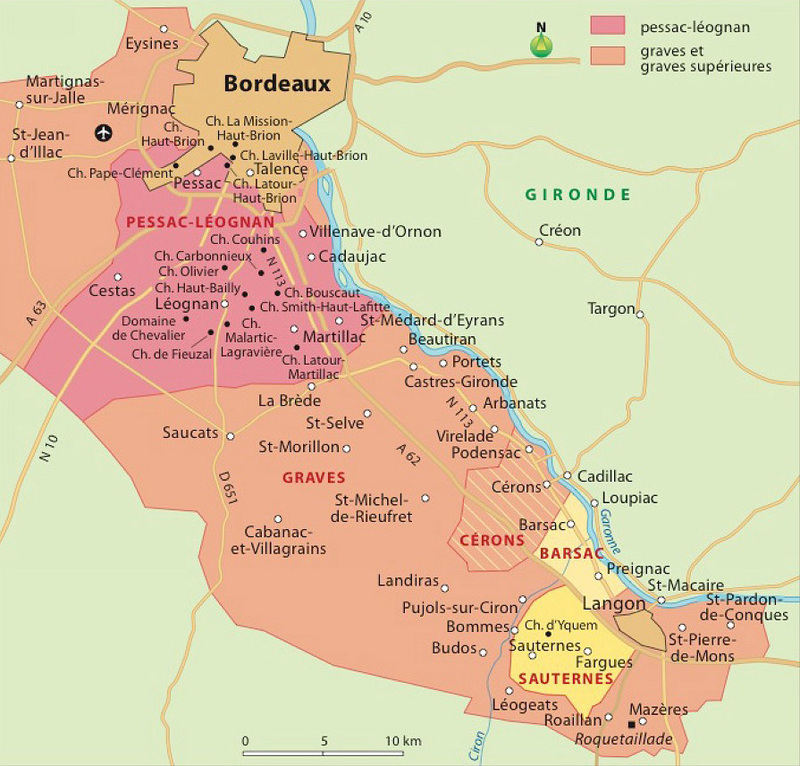 And finally, atop the reasons already cited above (Appellations, Terroirs and Grape Varieties), the wines of Bordeaux also differ from one another (like any other wines in the world) due to the age of the vines, the weather, the quality of the vintage, the environment, the vinification techniques used, the ageing process (concrete vats, stainless steel vats, used oak or new oak barrels,etc..), the final blend, and so much more.. not to forget also the winemaker style, the desired wine to be produced, the effect of culture, traditions and the level of expertise on the perception of the wine intrinsic qualities and dimensions. This list is nonexhaustive and so many other things could be added, yet that's a lot of reasons and diversities that explain quite obviously why it is impossible for all the Bordeaux Wines to taste the same!!! 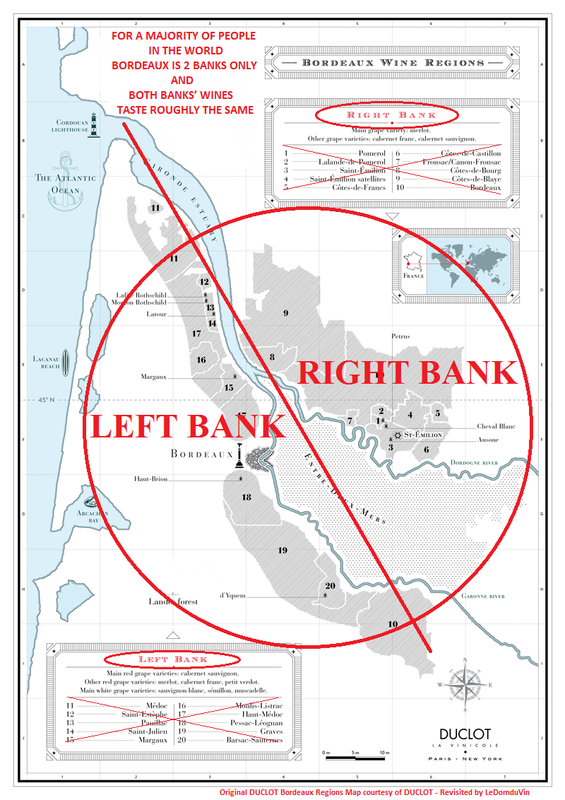 The comment cited above made on Facebook in response to "Le Monde" article is in my opinion the perfect example of the mass with a narrow, critical and reducing mind and spirit, and it is offensive in the eyes of all the other Bordeaux producers who are trying to change that image of "Bordeaux is 2 banks only and all wines taste alike". Do you agree? 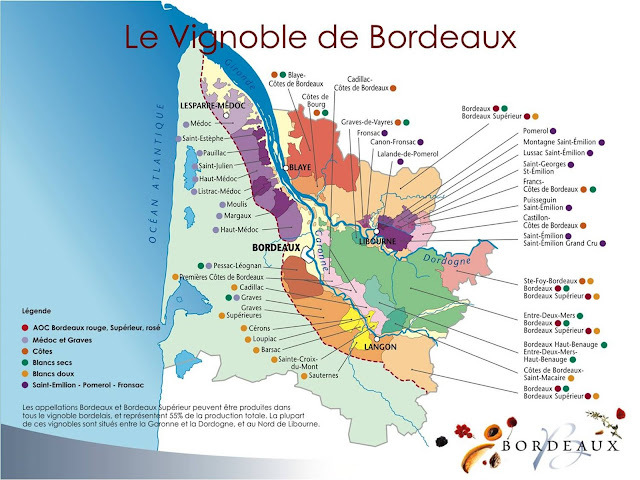 Or do you also think that all Bordeaux are similar and that there are only two banks? This is an amazing book for wine lovers. It highlights how is a wine made. It will be liked by many. Thank you for your suggestion. Thank you, glad you found the info useful. Not bad, that's what I was looking for! Thank you Kate. Glad I could help a little.